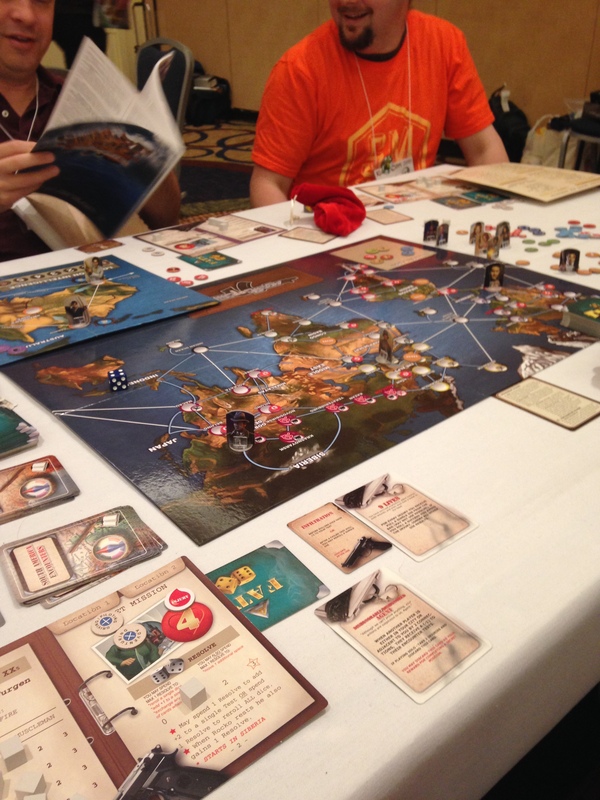 As mentioned in my Kublacon Postmortem last week, the other game that I ran was Agents of SMERSH (Affiliate Link). This is a game based on Tales of the Arabian Nights. I have not played Tales of the Arabian Nights, but the premise intrigued me. Every turn, players encounter fairy tale situations, and must make a choice. Based on this choice, they look up the result in a book of tales. They could become rich, cursed, thrown to the other side of the map… I have heard a lot of complaints about it, and most of them involve the randomness of the game. It is a cross between a DM-less roleplaying game and a choose your own adventure book. Agents of SMERSH hoped to improve that formula by slathering it with a healthy dose of James Bond frosting. So is it better than the original? Review time! 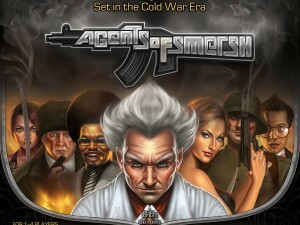 I have played Agents of SMERSH several times, both solo and with other players. The first thing that strikes me is the inconsistency of the game. I have had games where every challenge was a struggle, and I lost in less than an hour. The game I ran at the con, by contrast, was cake. We lost a single challenge in the entire three hour play time, and it never felt tense. Unfortunately, I don’t think there is any way to rectify this. But first, I need to explain how the game works. Each player has 5 stats, and a number of advanced skills. Whenever a player attempts a challenge, they are told what stat is necessary, and then pull a number of dice equal to the stat’s value from a bag. The level of control this gives the players is minimal, as the dice themselves are chosen randomly, and vary in usefulness. The challenges rarely correspond to the choice selected by the player, so players can’t control what stat is used, what dice are pulled, or what they roll. Any one of these levels of randomness would have been sufficient, but adding the three together only makes challenges unnecessarily tedious. Advanced skills are much more interesting. These are things like driving, gambling, weapons use, etc. If a player has the correct advanced skill, they automatically pass the challenge. Great in concept, but in actual play, the binary results often felt either boring (You automatically pass, so you don’t roll dice) or disappointing (Because you didn’t automatically win). I can’t help but feel that the system would be improved if there was less randomness in it. Instead of pulling dice, roll a d6 and add your stat. If you have an appropriate advanced skill, you get to add a second die. Still random, but it doesn’t involve the extra steps that add nothing except game length. So why isn’t it possible to rectify the randomness problem? The short answer is that there’s just too many encounters. The book is a meaty slab, hundreds of pages thick. Encounters are split by region (continent), and further diversified by pulling a card. Players are given a generic description of what is going to happen (IE “Ambush”) and choose a response from a reaction table. “Joke”, “Play it cool”, “Act on Instinct”… These are supposed to be hints as to what kind of challenge they are, but in practice, completely random. I would pick “Wait”, hoping to use my high Spycraft stat to set up a stakeout, and instead need Seduction for a fashion contest. The amount of work it would take to tie encounters to specific stats would be tremendous, and even worse than that, allow powergaming. Who would ever pick “Joke” if it was linked to their worst skill? Players would choose whatever response gave them the best outcome, and cut away dozens of the silliest encounters. Each turn, players move around on the board, attempting to locate Intel. Intel is placed randomly each turn, and represents pieces of information necessary to defeat the nefarious Dr. Lobo. Whenever a player picks up a piece of Intel, they have a choice: Save it to use in the final encounter, or discard it to reveal the location of a henchman. Defeating henchmen is required to find the location of Dr. Lobo’s secret base, while scoring Intel is necessary to defeat him once you find it. This provides a reasonable objective over the course of the game, as Intel appears and disappears often enough to remain engaging. Between Intel and secret missions, you can accomplish something on your turn about 50% of the time. The use of Intel, however, makes for a very anti-climactic end game. When you finally track down Dr. Lobo and corner him in his secret volcano lair, you flip up all your Intel tokens, and compare them to Dr Lobo’s level on the advancement track. If you have the necessary Intel, you win! If you don’t, you lose! Whaaaaat? I just spent two hours traipsing around the world collecting Intel, fighting henchmen, and saving damsels in distress to hear “Oops, you were missing an Atomic Intel token, you lose.” I facepalmed when I read that. Where’s the epic final encounter? Everyone gathering for one final assault, using your Intel step by step as you infiltrate his base? The core mechanic of the game is relatively solid, but the end game screams “We had no idea how to end it.” I can sympathize. Sometimes you have a good idea for a play mechanic but not a goal. But that means you should buckle down and rework it, not launch a campaign on Kickstarter. 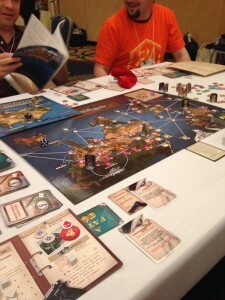 I feel that the lack of an end game is the biggest flaw in the game, and was disappointed that they didn’t choose to rectify that in the second edition of the game. So, Tinker Bunny, is the game terrible? My finger hovers over the “y” key, but I just can’t press it. There’s a lot to love in this game. The encounters, while frustratingly random, are varied, and sell the theme perfectly. You are, actually, a spy, and get to do all kinds of spy things. Infiltrating nefarious organizations, planning stakeouts, following double agents, and drinking vodka martinis (shaken, not stirred). There are recurring characters in the adventure book, from your bumbling gadgeteer to a femme fatalle, which makes the stories feel connected. The encounters are alternatively funny or action packed, and are almost always a pleasure to endure. But the most brilliant part of the game is the Status cards. If an encounter revokes your License to Kill, it really revokes it. You are handed a Status card stating you are on probation. You can gain Nerves of Steel, activate a laser Watch, or even pick up a Shoe Phone. The Status cards, coupled with the Advanced Skills, really give you a feeling of advancement, starting you off as a rookie and evolving you into an agent worthy of the name. So what niche does the game fulfill? It’s a social, cooperative game, where players have more fun finding out what happens to them than if they win or lose. I hesitate to call it a game, to be honest, as “experience” would be more accurate. If you want to star in a spy movie with your friends, you would be hard pressed to find a better way to spend two hours. If three levels of randomness sounds like torture, you should avoid this game.